Columbus Fountain in Washington, D.C. Located in Washington, DC, the National Mall and Memorial Parks (NAMA) protects and administers some of the oldest parkland in the National Park System. Its many monuments, memorials, and buildings are tangible reminders of the commitment of the United States to freedom and equality within its own borders and around the world. While many of these sites recognize the legacies of presidents, Civil Rights leaders, and other influential figures in the American story, others commemorate the contributions of Latino leaders who brought freedom and change throughout the Americas and played important roles in the history of the United States. Between 1808 and 1826, Hispanic liberators fought against the Spanish Empire in a series of military engagements, known collectively as the Wars of Independence, to establish independent nations throughout the Americas. The success of the American colonists in defeating the British during the American Revolutionary War influenced these liberators as they sought to establish republic ideals throughout the Americas and to gain independence from Spain. Through the Wars of Independence, Hispanic liberators successfully freed most of the Spanish colonies in the Western Hemisphere, except Cuba and Puerto Rico. Statues in the National Mall and Memorial Parks honor Hispanic liberators José Gervasio Artigas, Simón Bolívar, José de San Martín, Bernardo de Gálvez, and Benito Juarez. These statues were gifts from Argentina, Mexico, Spain, Uruguay, and Venezuela to the United States. Additional historic places in Washington, DC that recognize the contributions of other Hispanic leaders to the history of the United States include Farragut Square, the Organization of American States Building, and the Columbus Memorial Fountain. A walking tour along Virginia Avenue, NW, from Constitution Avenue, NW to New Hampshire Avenue, is the best way to see these sites. The National Mall and Memorial Parks’ “Statues of the Liberators, Hispanic Heroes Walking Tour” is available as a printed brochure that can be downloaded here. Visitors are encouraged to follow the tour with an audio narrative by calling 202-595-1730. After viewing what there is to see along Virginia Avenue, NW visitors can head to Farragut Square and the Columbus Memorial Fountain to see additional places that commemorate Hispanic leaders. A good place to begin a walking tour is at the Organization of American States (OAS) Building, located at 17th Street and Constitution Avenue, NW. This building, which is listed in the National Register of Historic Places, was constructed to house the Pan American Union (later renamed the Organization of American States). The Pan American Union was established to strengthen relationships between the nations of the Americas, to support democracies, and to resolve international issues peacefully. Using Georgian, Tennessee, and Italian marble, architects blended North and South American architectural styles to construct the building in 1908. The area near the OAS building became a central location for the placement of statues and memorials commemorating Hispanic liberators. Leaving the OAS Building, walk to the bronze José Artigas Statue at 18th Street and Constitution Avenue, NW. The Republic of Uruguay gave this statue to the United States in 1950. José Artigas (1764-1850), often referred to as the father of Uruguayan independence, was born in Montevideo on June 19, 1764. Artigas was a gaucho (cowboy) for many years and served in the Corps of Blandengues, a unit of the Spanish military that resisted the British invasion of the Río de la Plata region. By 1810, Artigas decided to offer his support and military skills to the junta in Buenos Aires - a newly established military run government that wanted to free the region from Spanish control. To support the cause, Artigas commanded a small army of gauchos and volunteers. 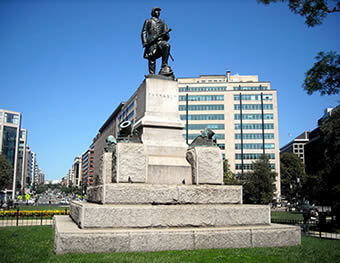 Artigas and this small army defeated the Spanish at Las Piedras, and they besieged Montevideo for a brief time. As the Buenos Aires government gained control of the area from Spain, it attempted to assert centralized economic and political control over the entire region. Artigas disagreed with this action, because he thought that each area within the region should be politically and economically autonomous. Consequently, Artigas broke from Buenos Aires by 1813. Abandoning his allegiance to the Buenos Aires junta, Artigas then became the leader of independence for Uruguay and retreated to an interior part of the country where he proclaimed himself “Protector of Free Peoples.” In 1820, Artigas unsuccessfully fought Brazil’s annexation of Uruguay, and he was forced to live in exile in Paraguay. In 1825, Uruguay finally attained independence – a triumph due in part to the initial efforts of Jose Artigas. 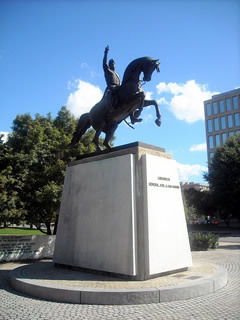 From the José Artigas Statue, continue northwest along Virginia Avenue, NW, to the Equestrian of Simón Bolívar Statue located at 18th and C Streets. Venezuela presented this 27-foot bronze equestrian statue to the United States in 1959. Known as The Great Liberator and as a revolutionary genius, Venezuelan Simón Bolívar (1783-1830) fought in more than 200 battles against the Spanish in the fight for South American independence. Bolívar provided the political and military leadership for freeing Bolivia, Colombia (then including Panama), Ecuador, Peru, and Venezuela from the Spanish empire. Water fountains that adjoin the Bolivar statue represent these nations. Leaving the Equestrian of Simón Bolívar Statue, continue northwest on Virginia Avenue for about two and half blocks to the General José de San Martín Memorial at 20th Street and Virginia Avenue, NW. Argentinean citizens gave this equestrian monument to the United States in 1925, and the bronze plaque on the back of the sculpture associates San Martín to George Washington because they shared desires for democracy, justice, and liberty. Like Simón Bolívar, José de San Martín (1778-1850) was one of the fathers of South American independence and sought the creation of an alliance of nations in South America. Born into an aristocratic family in Argentina, San Martín received his education as a boy in Spain. He then pursued a career in the Spanish Army and even fought against Napoleon. He became interested in a new cause when Argentina declared its independence from Spain and immediately requested to be relieved of his command to return to South America. Once in South America, Martín offered his services in the Argentinean, Chilean, and Peruvian struggles for freedom. He even led a dangerous 24-day march through the Andes to overcome the Spanish for the liberation of Chile. Leaving the General José de San Martín Memorial, continue northwest on Virginia Avenue about two and a half blocks to the Bernardo de Gálvez Statue at 20th Street and Virginia Avenue, NW. King Juan Carlos of Spain made a gift of this equestrian statue to the United States in 1976 in honor of the United States’ bicentennial. Bernardo de Gálvez (1746-1786) was the governor of the Spanish province of Louisiana during the American Revolution and played a pivotal role in supporting the American colonies’ fight for independence. Gálvez provided supplies to the American colonists and forced the British out of west Florida. He corresponded directly with leaders such as Thomas Jefferson and sealed off New Orleans so that the British could not use the Mississippi River. Even though he was the governor of Louisiana who owed allegiance to the Spanish Crown, he aided the American colonists in their fight for independence by helping them defeat the British. Just a few blocks northwest of the Bernardo de Gálvez Statue is the Benito Juárez Statue at Virginia Avenue, NW and New Hampshire Avenue, NW. Mexico gave this 12-foot bronze statue of Benito Juárez (a copy of the original located on a mountain in Oaxaca, Mexico) to the United States in 1969. Benito Juárez (1806-1872), known as the Father of Modern Mexico, was born into poverty but rose to become a lawyer, an active liberal politician, and eventually, to serve as the President of Mexico from 1858 until 1872. During his political career, Juárez successfully defended his government against the French, the Catholic Church, and military and conservative opponents. Juárez is remembered as a progressive reformer committed to defending democracy. After viewing the many sites along Constitution and Virginia Avenues, take a short excursion to nearby Farragut Square to see a statue of David G. Farragut. Farragut Square is between K Street NW on the north, I Street NW on the south, and parts of East and West 17th Street about 10 blocks north of the OAS Building (where the walking tour began). The United States Congress in 1872 commissioned the David G. Farragut statue in the square. Its dedication occurred on April 25, 1881. David G. Farragut (1801-1870), whose father was a Spanish merchant captain who served in the American Revolution and the War of 1812, began his life as a sailor in the U.S. Navy at the young age of 9. By the time of the American Civil War (1861-1865), Farragut had already proven himself repeatedly in the military. Although he grew up in the South, Farragut chose to fight with the Union during the Civil War. He led many successful military campaigns during the Civil War, but is especially renowned for taking the city and port of New Orleans and eventually securing Mobile Bay, a seaport in the Gulf of Mexico, for the Union. Complete the walking tour by making a stop at the Columbus Memorial Fountain directly in front of Washington, DC’s historic Union Station. The Columbus Memorial Fountain features a globe on top of a monument surrounded by figures representing the old and new worlds. In the center of the old and new world figures is a statue of Christopher Columbus. Columbus (1451-1506), an Italian explorer who in 1492 sailed west into the Atlantic Ocean on a voyage of discovery for the Spanish monarchy, opening the age of European exploration and colonization of the Americas. 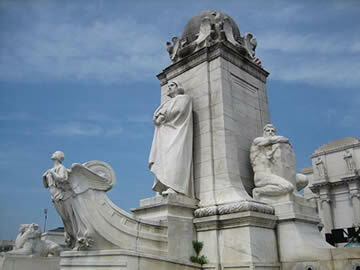 At the memorial, Columbus is standing at the front of a ship adorned with a winged figurehead symbolizing discovery. Three flagpoles surrounding the memorial fountain represent the three ships, the Niña, Pinta, and Santa Maria, that carried Columbus and his crew to the New World. National Mall and Memorial Parks, a unit of the National Park System, is located throughout Washington, DC. 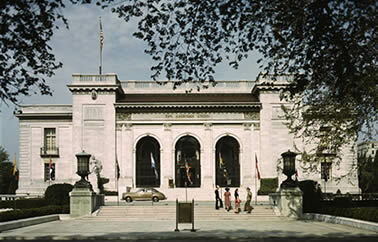 Click here for the National Register of Historic Places file for the Organization of American States Building: text and photos. The park is open 24 hours a day with park rangers on duty at the Memorial sites to answer questions from 9:30am until 11:30 pm daily. For more information, visit the National Park Service National Mall and Memorial Parks website or call 202-426-6841. Virginia Avenue, Washington, D.C. and Columbus Fountain have been documented by the National Park Service’s Historic American Buildings Survey. The National Mall and many of the Memorials within the National Mall and Memorial Parks are featured separately in the National Park Service Washington, DC Travel Itinerary.